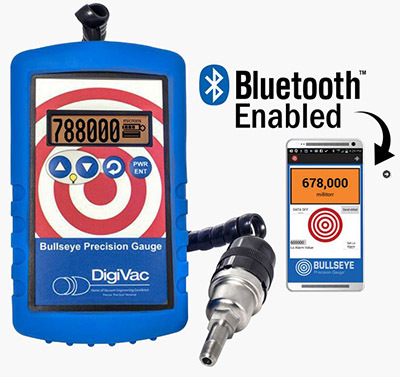 The Bullseye portable precision vacuum gauge presents a new level in portable vacuum measurement. With the robust gauges and rugged control units it offers unrivaled flexibility and connectivity. 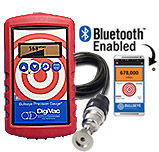 The Bullseye Bluetooth enabled gauges enable monitoring from mobile devices (Android or Apple), alarm settings and documenting vacuum data. This lightweight unit is easy to use in the field for on-site measuring, but is equally useful as a lab or test vacuum gauge. The Bullseye precision gauge combines portability, versatility, documenting and visual analysis all in a single instrument. The back-lit LCD display shows the vacuum level either numerical of in a graph. Settings can be easily changed with the front push button control; Menu settings flowchart for Pirani vacuum gauge. choice of four different models. The Bullseye vacuum gauge is the ideal tool for service engineers and field maintenance engineers. With the small footprint, the long coiled cord and magnetic hook it will easily find a place so you will have your hands free to work while monitoring the vacuum level. 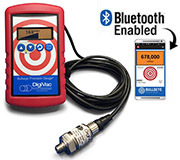 If you suspect a leak, want to monitor pump-down, measure vacuum performance or check on out-gassing just connect the sensor and use the Bullseye to measure and document. The Bullseye includes instant conversion between 12 different vacuum units; this ideal if vacuum performance needs to be checked on older or foreign equipment. Units converted are: Torr, mbar, bar, kPa, Pa, PSI, inches of Hg, mm Hg, millitorr, microns, inches of H20, mm of H2O. Menu settings flowchart for thermocouple gauge. 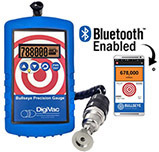 On stationary vacuum equipment, the Bullseye bluetooth enabled precision gauge would be ideal to replace older equipment and offer instant remote monitoring and data storage on mobile devices. In manufacturing, technicians can instantly check and document performance of vacuum assemblies and equipment.